Boatrocker’s love of all things Belgian continues with their latest short run release. The Tripel (or Trippel as it says on the tap decals) follows in the footsteps of the strong Belgian dark ale Sterk & Donker, being almost as strong but of the fairer tripel persuasion and pouring a bright, light golden colour. It also, like many beers of its ilk, seems to bring about a spot of synaesthesia at Crafty Towers in that this viscous liquid not only looks glistening but smells glistening: its combination of sweet malts, soft spice and bubblegum esters and a touch of booze come together to give an almost unreal, inorganic texture to the aroma. But maybe that’s just us (we do sometimes think of beer profiles as varying shapes of distended orbs) and it is an observation of tripels generally, both Belgian originals and Belgian-inspired alike. Or maybe it’s just a total inability to get across the experience in words and a need to devour a few dictionaries. 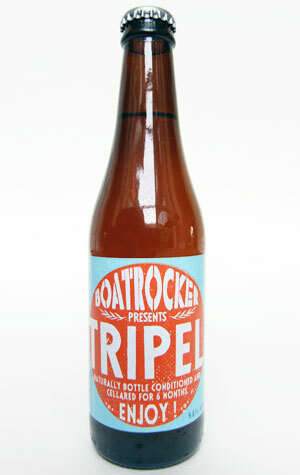 Anyway, moving swiftly on… The Tripel is a beer that’s been given time to grow into itself; brewer Matt first flagged it up as on its way in April but has allowed it to bottle condition and cellar for six months before sending out into the world. The result is as creamy a mouthful as you could wish for with that soft, green pepper spicy sweetness apparent on the palate and a warming tingle that comes on steadily over the course of a glass. They’ve clearly not left it unattended in the cellar for the entire six months, however, with careful research leading them to conclude it’s a great pairing for “asparagus, basil, cured meats” or more Tripel, of course.